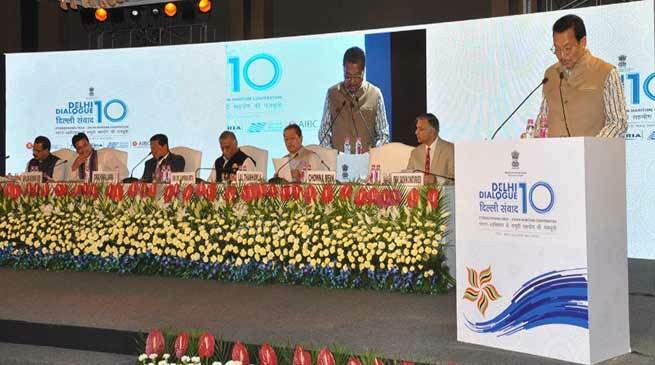 The North Eastern region (NER) under PM Narendra Modi’s visionary leadership has embarked upon a new growth trajectory to become new engine of India’s growth, Arunachal Pradesh Deputy Chief Minister Chowna Mein said in his address to special plenary session of 10th Delhi Dialogue here today. “Special attention and priority has been given to NER by the GoI on all fronts through its pro-active ‘Act East Policy’ which has vastly changed the mindset of people of other parts of the world about the region. “As part of this policy, GoI is focusing on reducing NER’s isolation by improving all round road, rail, telecom, power and waterways connectivity and making it the gateway to South East Asia (SEA), Mein said, adding opening up of road and rail routes to our neighboring countries through NE would give a boost to its economic development, he said. Enlisting GoI’s steps, he said that the NER can be a hub to facilitate development cooperation across the border with immediate neighbourhood nations, like Myanmar, Nepal, Bangladesh & Bhutan and even with those little away, like Cambodia, Laos PDR & Vietnam. The mutual benefit accruing to India from such development cooperation activities will spill over in more than proportionate manner to the NER, he said and stressed on more efforts to fructify establishment of clear convergence with India’s Act East Policy which can be achieved only thorough ground level one-on-one mapping of interventions both within the NER and in neighbourhood is carried out. The agreement on land border crossing which was one of the seven agreements/MoUs inked during recent visit of External Affairs Minister Sushma Swaraj to Myanmar on May 10 & 11 last is a landmark in bilateral ties between both nations as it will enable people from both countries to cross the land border with passport and visa, including for accessing health & education services, pilgrimage and tourism, he said, adding the MoU on restoration of pagodas underlines the enduring cultural and historical links between both nations. Age-old cultural & historical bonds could be invariably revived by translating these policies into reality by the GoI as there exist racial, linguistic and cultural similarities among the people of NER and those SEA nations, he reasoned. He stressed on straightway step forward for the up-gradation of communications in this part of the region citing that with better road communications, networking facility & other peripheral sector, there will be further enhancement of trade to usher in people to people contact and cultural exchange from both sides leading to strengthening bond between both nations. He suggested for a bilateral dialogue with Myanmar to improve border security and impede drug trafficking, especially opium from across the borders. He reiterated to consider opening up of Stilwell Road up to Myanmar as it would be mutually beneficial to both nations and facilitate trans-border trade and tourism. Operationalizing India-Myanmar-Thailand Highway into a robust transportational network and strengthened roads leading up to Tamu-Moreh would help to realize true potential of NER, he said, and called for urgent need to take up building Lumla (in Tawang, Arunachal Pradesh) to Tashigang (in Bhutan) road for strengthening the border trades between both nations. Pressing for setting up a hospital with modern state-of art facilities in TCL region for the benefit of people living on both sides of the border, he said it would act as a goodwill gesture and benefit the people of the area where existing medical facilities are far from satisfactory. He also pressed for creation of integrated check posts at the border with proper security and custom facilities and consider opening of border haats in feasible locations to boost trans-border trade. He also made a plea to the Govt of India for early action for re-opening of Land Customs Station, Nampong (Pangsau Pass) with required infrastructure and also for posting of a Customs Officer which will not only benefit the State of Arunachal Pradesh but also the entire North East India and also examine opening up of more Land Custom Stations across Indo-Mynmar Border. State’s tourism sector could also be the fulcrum of Act East Policy and the NE Tourism should take advantage of brisk tourism in SEA, he suggested that North East Tourism Development Council (NETDC) on behalf of all state tourism departments and NER tour operators should enter into a MoU with tourism authorities and tour operator associations of ASEAN nations to make tour packages connecting the whole NER and ASEAN. “Arunachal Pradesh is the seat of ancient Buddhist traditions at Tawang and there is a scope to promote a new Buddhist tourism network to attract tourists from Thailand, Cambodia, Laos and Vietnam to Buddhist pilgrimage centres in Sikkim, Nepal, Bhutan and Arunachal, even beyond to Gaya and Lumbini,” he said, adding development of eco, wellness, adventure and spiritual tourism in the state would help provide huge employment opportunities to its people”. Mein accompanied by chief secretary Satya Gopal later attended ministerial session chaired by Swaraj at Hotel the Oberoi, attended by ministers, ambassadors, delegation of heads of ASEAN nations and NER CMs. World’s Cheapest Smartphone Freedom-251, delivery will start from 30th June.